Dental care is vital to the overall health of any animal. Dental disease can lead to health issues with the heart, liver, and kidneys, and can affect the entire body through the bloodstream. In fact, 80 percent of dogs and 70 percent of cats over three years of age suffer from some form of dental disease, making it the most common pet health issue among our pet population. Unfortunately, our pets don’t let us know their mouth is bothering them until dental disease is extreme! They just put up with the discomfort homing someone will help them out. 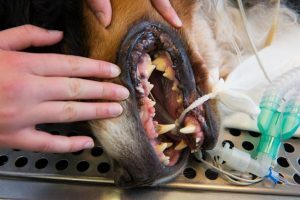 In spite of these disturbing facts, many pet owners are not aware of the importance of dental care to their pet’s health. There are a lot of different ways to improve your pet’s dental hygiene, including home brushing, dental chews, regular inspection and professional dental cleaning procedures. The most effective way to protect your pet from dental disease is through professional cleanings. We perform thorough cleanings, including the area beneath the gums that you can’t see or access at home. 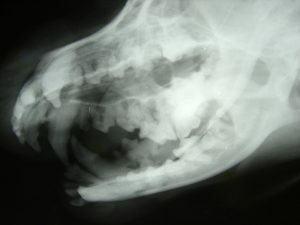 We also take dental x-rays to evaluate problems beneath the gum line where we cannot see. Dental procedures at County Line Pet Hospital are performed by well-trained certified veterinary technicians. All anesthesia procedures including dental procedures involve close monitoring of your pet’s heart and respiratory rate, blood oxygen level, EKG and blood pressure. All patients receive IV fluids to support blood pressure during the procedure. We place an airway tube to protect the airway during the procedure. You may be surprised how much better your special friend feels after we clear up those dental problems! If your pet has brown/yellow teeth, bad breath, or is having difficulty eating, these could all be signs of dental disease. Please call us at (708) 754-2351 today to learn more and schedule your pet’s dental cleaning.